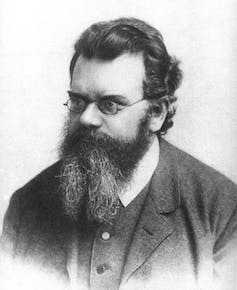 Ludwig Boltzmann (1844-1906), Austrian physicist. To elicit the laws of history we must leave aside kings, ministers, and generals, and select for study the homogeneous, infinitesimal elements which influence the masses. The boundaries of these coloured regions of Great Britain are isoglosses. 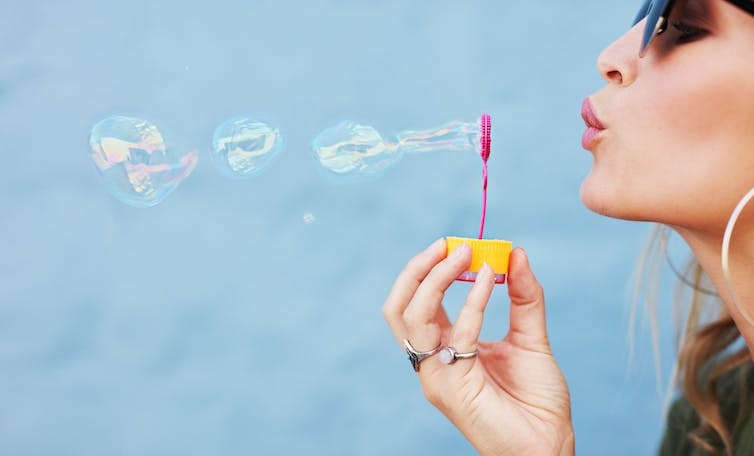 Physicists have known for a long time that in these magnetic materials the boundaries (curved lines) of regions of uniform alignment evolve as if they were the surfaces of two dimensional bubbles: they feel a kind of “surface tension” which tries to smooth them out. Because a wiggly line connecting two points in space is a longer than a straight one, surface tension tends to make these boundary lines shorter. The aim of my work has been to explore what happens if we assume that isoglosses evolve in a similar way. From this assumption, we can derive equations for the spatial distribution of linguistic variables. 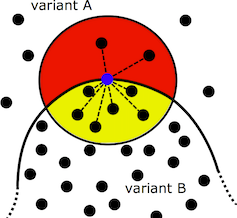 These equations predict that regions will emerge in which one variable dominates (e.g. where people call ulex “broom”), just like the regions in metals where all the atoms are aligned. These regions are like bubbles with isoglosses as their surfaces: the surfaces of the bubbles smooth out over time as if they were feeling surface tension. 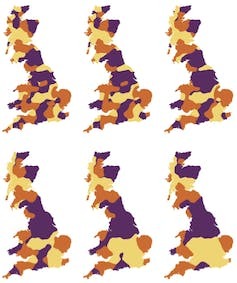 But there are some very important differences to physical systems: large population centres can have an opposite effect, causing isoglosses to become curved. I wanted to know whether the boundaries of countries influenced the pattern of their isoglosses and therefore the spatial pattern of their dialects. Using my mathematical models, I found that predictability arises due to the irregular shapes of country borders, and because people tend to clump together into towns and cities. Many other features of real language patterns also emerge: cities tend to lie at the centres of language bubbles, creating their own dialects; long thin countries tend to have striped dialect patterns, and the famous “Rhenish fan”, where isoglosses fan out around the cities of the river Rhine, can be explained in a simple way.